Workmanlike. 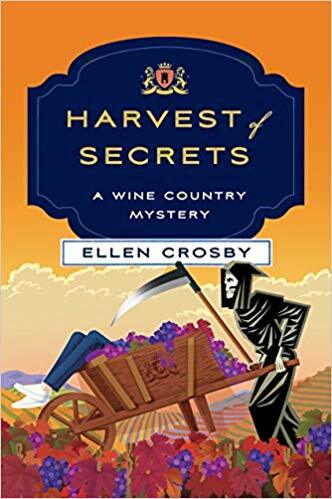 The ninth installment in the Wine Country Mysteries series by Ellen Crosby is a novel titled, Harvest of Secrets. Protagonist Lucie Montgomery faces more than the usual challenges at her winery in Virginia at harvest time. A storm is coming before the grapes have ripened as far as desired; old human bones have been discovered just outside the family winery, and there’s a murder to solve. While part of the structure of the novel is formulaic and the characters are often not fully formed, this novel will appeal to those readers who enjoy mysteries. I finished this book with the same kind of feeling I get after a glass of a moderately priced New Zealand Sauvignon Blanc: workmanlike, tastes exactly as expected, and not much complexity. Rating: Three-star (It’s ok) Click here to purchase Harvest of Secrets from amazon.com.